The 2017 club league is now underway. It has been revised in line with the decision taken at the AGM to focus on Claro events. Use the menu bar above, or click here to see the results so far. The Autumn street (Lamp-O) penultimate event was held from the Empress on Wednesday evening. The conditions were good for mid November, and Linda introduced a new twist of post boxes scoring double points that increased the route choice conundrum – the top 6 placed competitors had visited all 6 of them. The temptation to gather some controls around Starbeck – and misjudging the time to get back up the hill to the finish, led to me being 50sec late back. Caitlin missed the 45minute cut-off by just 2 seconds, but fortunately didn’t impact on her well earned 3rd place. Try a trickier night challenge at Hookstone this Saturday. It’s a few weeks since we held the AGM and it’s also two months since the last edition of Clarion. It’s time to give members an update on a few things that have happened. Firstly, despite what was said in the last ‘Pateley Prattlings’ column of Clarion, I’m still the club chairman. The club constitution permits me to serve this fourth and final year when the committee recommend it; this was endorsed by the AGM. I’m likely to be twisting arms later in the year as we seek a successor. At the AGM we agreed to leave our own club membership fees unchanged for 2017. 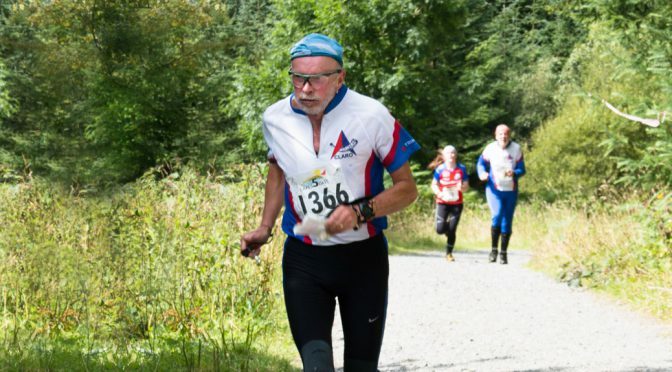 British Orienteering will be increasing their element of the overall fee to £10 for seniors, so that it will cost adult members £15 in total to renew their membership. Membership can be renewed now via the British Orienteering website and will need to be done before competing in any events after 31 December. The AGM agreed to give a significant subsidy to the new clothing range, particularly the lightweight jackets, so that we can get the club name visible around assembly areas and elsewhere. You will have seen lots of publicity from treasurer Linda about this. The jackets really are good and will fit in Santa’s stocking very nicely too. We received a substantial payment from the profits of Easter’s JK Festival in return for the huge effort that you all put in. The AGM agreed to support the search for new or revived venues that we might use and to spend funds on professional mapping if that was needed. While keeping costs under control we agreed that we would consider venues where a modest fee was needed for access. Very significantly for this article, the AGM agreed that Clarion magazine would no longer be issued. We now have a modern website and a Weekly News in its place and committee will be looking to use these to good effect to keep you up to date. Thanks to Vince for keeping Clarion running for the last couple of years and to Tim Evans who has now taken over the collation and publication of the Weekly News. Many of you know that on medical advice Vince has needed to stop competing and now divides his time between Harrogate and Portugal. I’m pleased to say that he’s remaining as club secretary (the joys of internet) and hopes to remain very much involved with the club. Speaking of medical matters, I’m sorry to say that I’ve torn a rotator cuff muscle in my shoulder and I’m likely to need surgery. While I expect to be out as a volunteer on club events I’m afraid that I shan’t be back competing until at least Easter. At my age when I fall I don’t bounce, I break.